77 records – page 1 of 2. 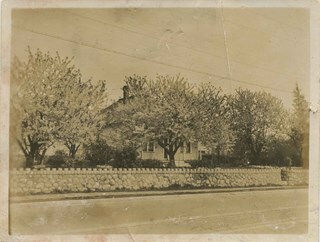 Photographic postcard of the exterior of the Stride family home located at Kingsway and 18th Avenue. Two people are traveling in a Model T Ford (with the top down) along the street in front of the house. 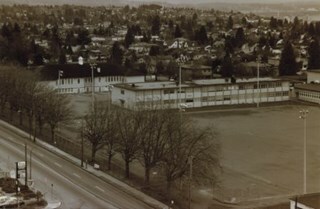 Photograph of the Stride family house located at Kingsway and 18th Avenue. 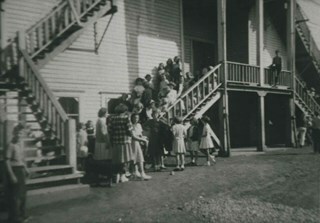 Photograph of the Stride family house located at Kingsway and 18th Avenue. It is obscured by trees in blossom. 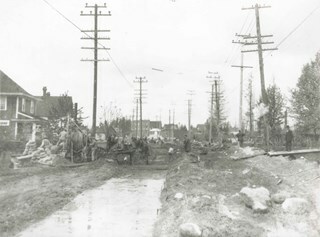 Photograph of road construction on Kingsway at 18th Avenue. Men and horses are working, and houses can be seen on the left side. 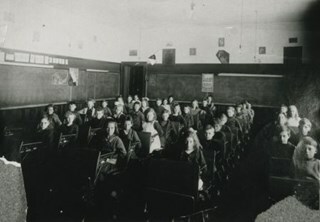 Photograph of W.H. 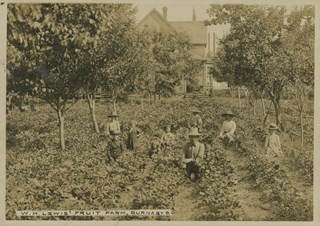 Lewis' fruit farm with a man, three women and five children kneeling in a strawberry field. 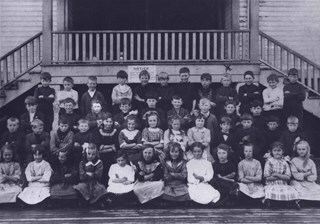 "Pioneer Tales" identifies them as William Lewis (foreground), three of his children, and hired help. 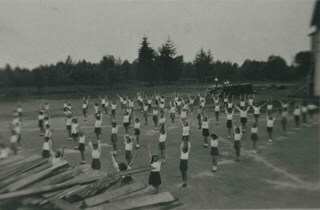 A house can be seen in the background. 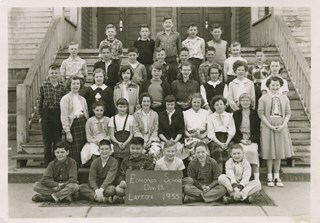 The Lewis house was located on 4th Street. 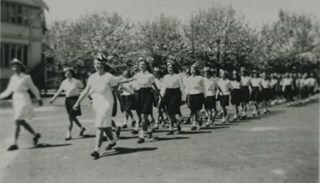 Annotation at bottom of photograph reads, "W.H. 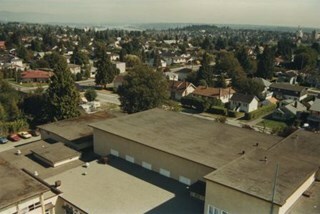 Lewis' Fruit Farm, Burnaby, B.C." 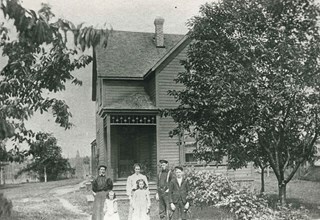 Photograph of Lewis family in front their house at 4th Street and 18th Avenue. 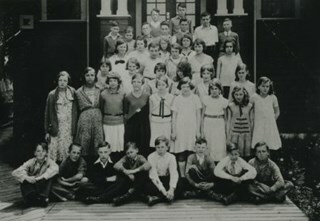 "Pioneer Tales" identifies them as, left to right, Emma Lewis (mother) and children: Evelyn, Lizzie, Lillie (later, Lillie Porter), Albert, and Ernest. 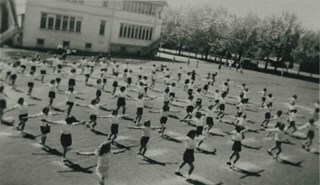 The description in the accession file reads "Greenhouse, root house, cherry tree." 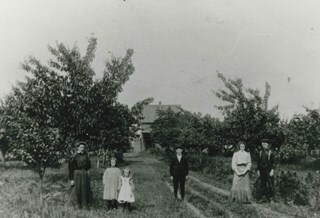 Photograph of the Lewis family in the orchard of their home at 4th Street and 18th Avenue. 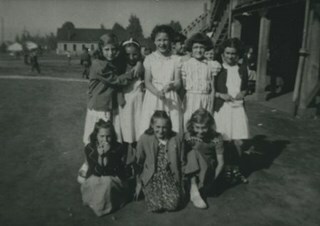 "Pioneer Tales" identifies them as, left to right, Emma Lewis (mother) and children: Lillie (later, Lillie Porter), Evelyn, Ernest, Lizzie, and Albert. 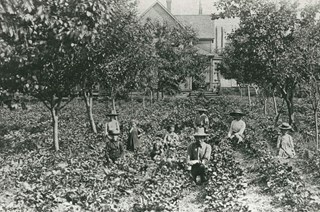 Photograph of (left to right) Lillie Lewis (sister - later Lillie Porter), William Lewis (father), Evelyn Lewis (sister), and Ernest Lewis (brother) picking strawberries at the side of their house. 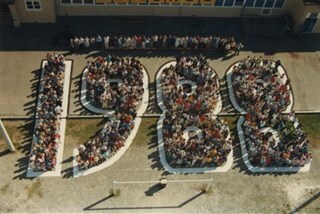 Note the apple trees all around. 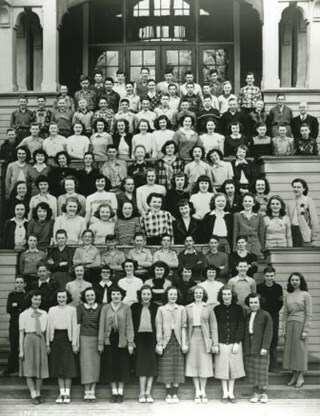 The other people in the picture are unidentified hired help. Photograph of the Lewis family. 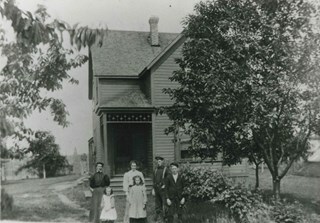 Left to right: Mrs. Emma Lewis (mother) and children Evelyn, Lizzie, Lillie (later, Lillie Porter), Albert and Ernest in front of their home. 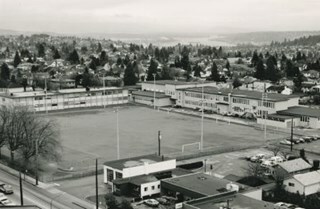 Note the cherry trees, mostly Queen Anne reds. 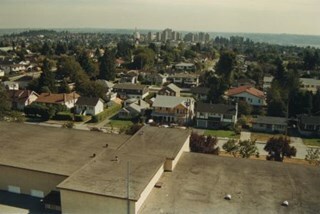 Photograph was taken looking south-east from a fire ladder above Edmonds Street School, with the school's rooftop as well as its surounding neighbourhood visible. 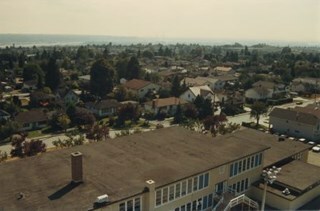 Photograph was taken looking south from a fire ladder above Edmonds Street School, with the school's rooftop as well as its surounding neighbourhood visible. 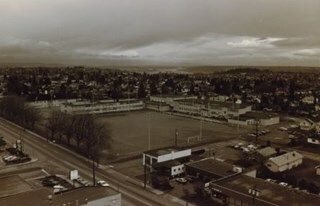 Metrotown is in the distance. 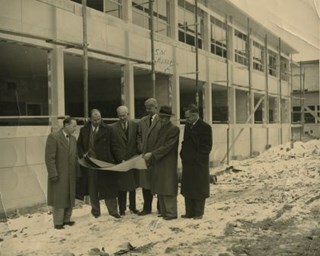 Photograph of six men consulting blueprints outside in the snow at the site of the Edmonds Street School addition under construction. 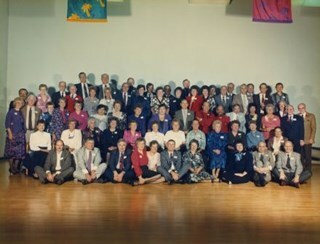 Standing in a row are;Trustee W. Maxwell, Architect Davies, Inspector Fredrickson, School Board Secretary Durkin, Trustee Samuel Norman Noble, and Principal Davis. 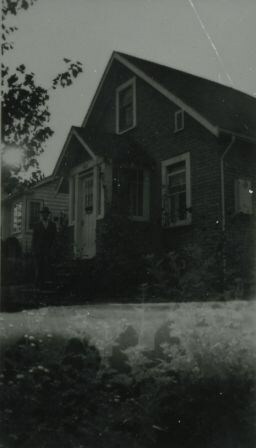 Photograph of the home of Charlie and Ruth Hollands at 631 18th Avenue (later renumbered 7865 18th Avenue). 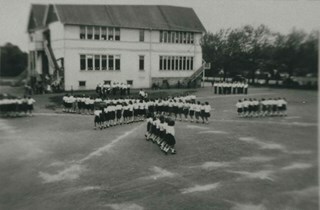 The house was built by Mr. Hollands in 1945-46 and later renovated. 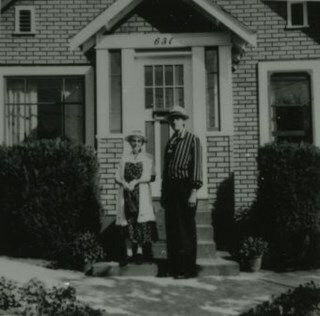 Photograph of Charlie and Ruth Hollands standing in front of 631 18th Avenue (later renumbered 7865 18th Avenue). 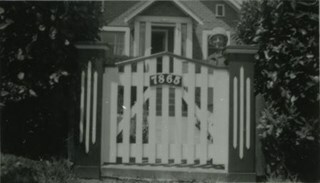 Photograph of Ruth Hollands standing behind the gate in front of her home at 7865 18th Avenue (previously numbered 631 18th Avenue). 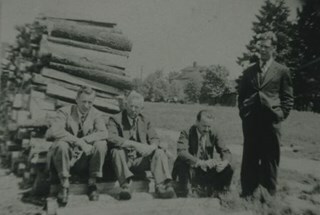 Photograph of lumber piled in preparation for the building 631 18th Avenue (later renumbered 7865 18th Avenue), the home of Charles "Charlie" and Ruth Hollands. 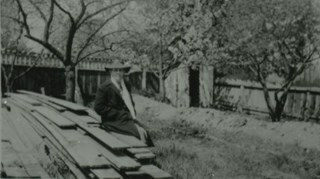 Ruth Hollands is seated on the lumber. 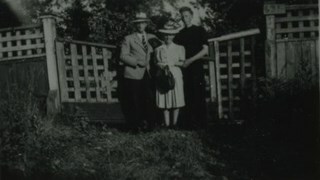 Photograph of Charles and Ruth Hollands, and their son Oz, standing at the lot of 631 18th Avenue (later renumbered as 7865 18th Avenue). 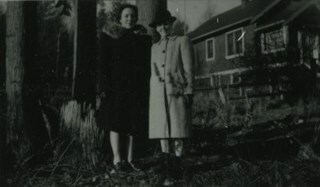 Photograph of Annette Thompson and Ruth Hollands standing on the lot of 631 18th Avenue (later renumbered 7865 18th Avenue). 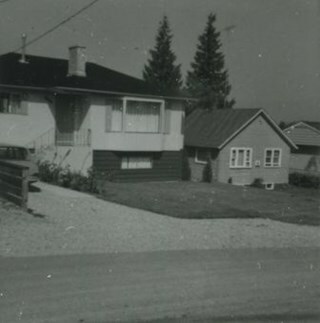 The Carpenter family home is visible in the background. 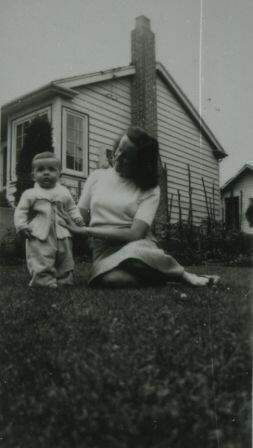 Photograph of Lois Coutts and her seven month old son, Stewart "Stu," at 631 18th Avenue (later renumbered 7865 18th Avenue). 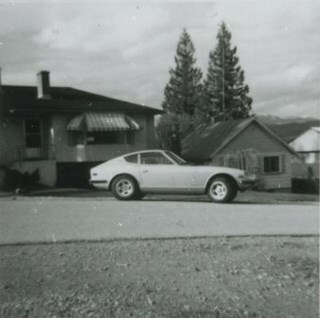 The house partially visible in background was owned by Dr. Gray, a chiropractor. 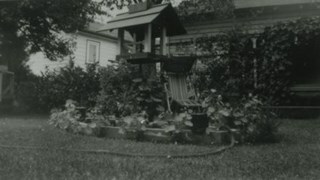 Photograph of a fish pond in the garden of 631 18th Avenue (later renumbered 7865 18th Avenue). 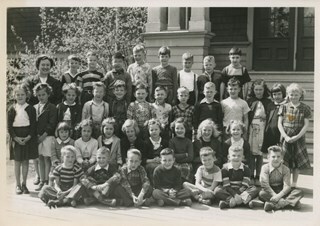 Photograph of the Grade 3 class at Edmonds Street School. 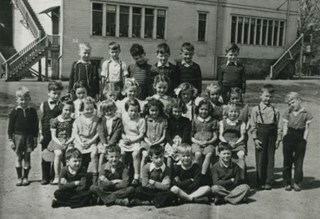 A note on the back of the photographs identifies the group as follows: Back row (l to r) - Doug Goss, Stanley J., Bobby Park, Ronnie Hill, Gerry Sung, Ricky Howard, unidentified, Leigh (last name unknown). 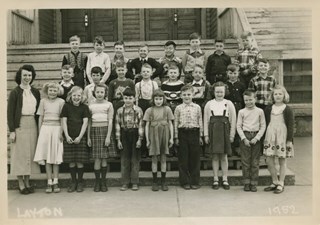 Second Row - Douglas World, Lionel B., Alan (last name unknown), Billy (last name unknown), unidentified, unidentified , unidentified. 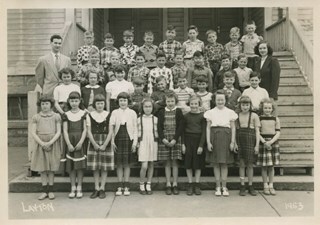 Front row - Miss Rapp (teacher), Diane E., Barbara B., Judy Shaw, David (last name unknown), Maureen M, unidentified, Linda G., Raymond (last name unknown), and Roberta Hollaway. 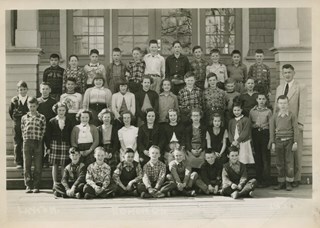 Note on verso reads: "Edmonds St. School / Grades 1-6 / 1952 / Teacher Miss Rapp" and identifies the students. 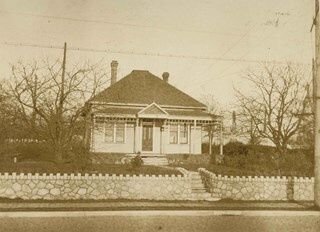 Photograph of the Loynes family home at 1855 18th Avenue (later renumbered as the 7000 block of 18th Avenue). 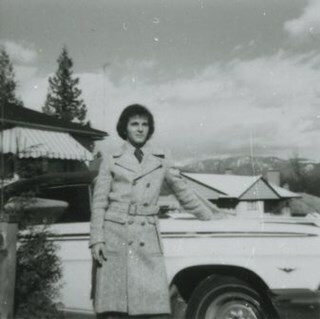 Photograph of Mike Loynes standing beside his car in front of 1855 18th Avenue (later renumbered as the 7000 block of 18th Avenue). 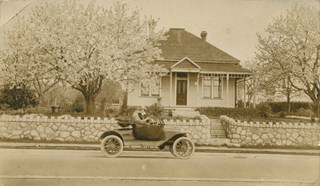 Photograph of the Loynes family home at 1855 18th Avenue (later renumbered as the 7000 block of 18th Avenue), with a car parked in front. 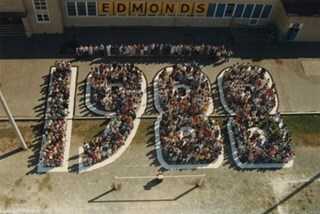 The photo was taken from across the street. 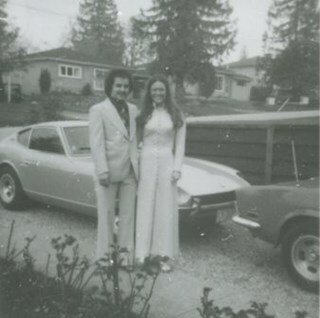 Photograph of Mike Loynes and his future wife, Linda, standing beside a car in the driveway of 1855 18th Avenue (old numbering) before attending a wedding.